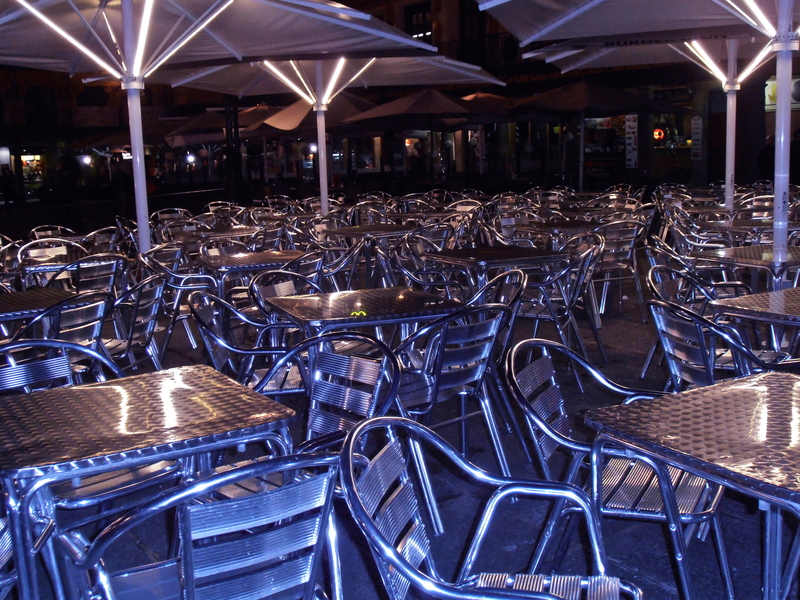 Toledo is a city of contrasts – at times bustling with throngs of punters, at other times desolate and devoid of life.This sea of empty metal chairs and tables outside Burger King on the main square caught my eye a couple of days ago, when I was on my way home around 10pm, after leaving a busy restaurant. Did you spot the McDonald’s “M” reflected in the table in the centre? MD’s is right next door. I’ve never eaten in either fast food joint. They are both heaving with tourists during the day. This entry was posted in Toledo Tales and tagged Fast Food, Food culture, Restaurants, Toledo on February 27, 2014 by ladyofthecakes. Who Eats The Most Potatoes? As for me, personally, I can take them or leave them. Probably my least favourite are boiled potatoes of the “mealy” kind, which taste of nothing and clog up your windpipe. Floury potatoes are only ever palatable with lashings of butter and/or cheese, preferably mashed. Potato crisps, chips, fries, etc … I will eat them if they’re put in front of me, but it’s not something I’d ever crave. However ambivalent I might feel about spuds and potato products in general, I do have one big weaknesses: Kartoffelknödel. For those unfamiliar with them, they are the big brother of the Italian gnocchi. (Gnocchi have been, in fact, my fail safe substitute in foreign lands). It’s the texture that does it for me. They are like soft, chewy, springy putty. Gravy (there HAS to be gravy) sticks to Kartoffelknödel like iron filings to a magnet. Kartoffelknödel are a common accompaniment to German meat dishes, like pork roast and Sauerbraten. OK, let’s get down to some figures. Which countries’ citizens consume the most fresh potatoes? I must admit, it was somewhat of a surprise to find Germany so frightfully low down on the list with just 22kg per capita in 2012. In 2007, it was still 30kg. Actually, Germany is very close to the global average of 23kg, but global consumption is slowly on the way up rather than declining. The reason for Germany’s dwindling fresh potato intake is the steadily growing popularity of processed foods, including processed potato products. Nobody wants to buy a bag of fresh potatoes anymore. I mean, they need preparation, perish the thought! Also, Germans scoff a lot of pasta and, increasingly, rice, displacing spuds as the national carbohydrate staple. Really… you eat them like THAT?!? As an aside – and things may have changed in the two+ decades since I left Germany – but eating a potato with the skin still on was totally unheard of back then. When I moved to the UK in the early 90’s, I was confronted with concept of “new potatoes” and baked potatoes. It was also the first time I’d seen people gobble up slices of (gasp!) unpeeled cucumber in their salads and sandwiches. I had clearly landed on an island inhabited by Pleistocene heathens. To my great relief, they did pull the skins off their bananas before biting into them, so not all was lost, as far as I could tell. Back to the stats: Trumping the fresh potato consumption charts is the Ukraine, with 143kg per person in 2012. Now, this sounds like some serious potato load, but it’s an underestimate, because potatoes grown on allotments/datchas etc, destined for private consumption, which never enter the formal market place, are excluded from these figures. Poland managed 116kg, and Russia 70kg. Incidentally, Peru, birthplace of the tuber, stood at 79kg per head. Irish spud intake almost pales into insignificance by comparison, with 47kg and a falling tendency, but Ireland is still ahead of the UK’s 30kg. The US, shock horror, barely musters half of that! But we all know why: fries. Next, let’s look at frozen processed potatoes. This includes potato chips for oven baking, potato waffles, croquettes, etc. The UK leads world per capita consumption with 21kg in 2013, followed by Australia and Canada (both 19kg), and the US (15kg). 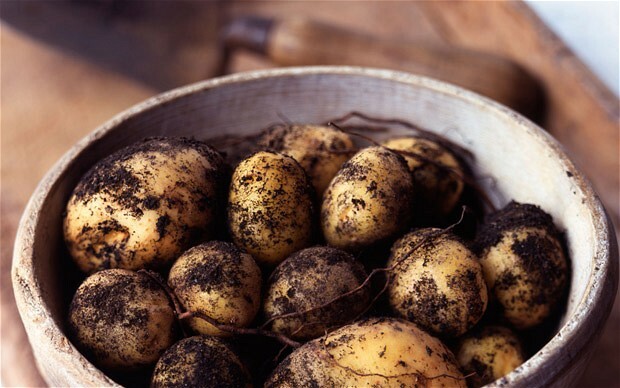 Anyway, let’s hear it from everybody else – what’s your fave potato product that you couldn’t live without? 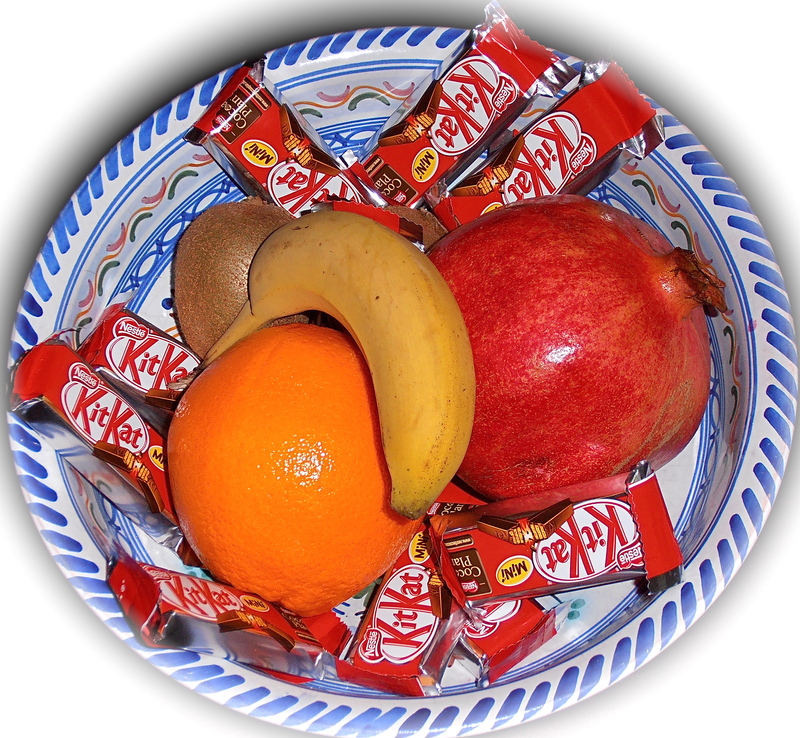 This entry was posted in Global Consumerism and tagged Consumer behaviour, Eating Habits, Fast Food, Food culture, Food Industry, Germany on November 4, 2013 by ladyofthecakes. Who Eats The Most Mayonnaise, Ketchup, Mustard? Mayo, ketchup, mustard – they all have their place. Sometimes they can be found in amiable unison, lubricating the innards of a nice juicy burger in fairly equal measures, but the uptake of these condiments shows considerable variation around the globe. Personally, I’m not overly keen on mayonnaise – give me sour cream instead any day – but it is a popular condiment in Germany, where liberal lashings of it are added to potato salad, for example. Germany is also infamous for ‘Pommes mit Mayo’ (Chips/fries with mayonnaise). It’s at least as popular, if not more so, than the ketchup alternative. You can get Pommes mit Mayo from any burger van, unstylishly served in either a paper cone or a cardboard tray. As for who eats the most mayonnaise, if anyone had asked me before checking*, I’d have plonked for the Japanese being the highest per capita consumers. I’ve seen them deploy this condiment, seemingly without any scruples, on most types of food, and especially on those that are not traditionally Japanese. But I was wrong. Japan is 20th down the list! It’s the Russians who are the true kings of mayo, clogging up their arteries with 5.1 kg of the stuff in 2013 per capita. Japan managed a comparatively humble 1.5kg, the UK just a smidgen more with 1.6kg, while Germany is quite a long way down with just 1.0 kg, less than half of Dutch consumption levels. 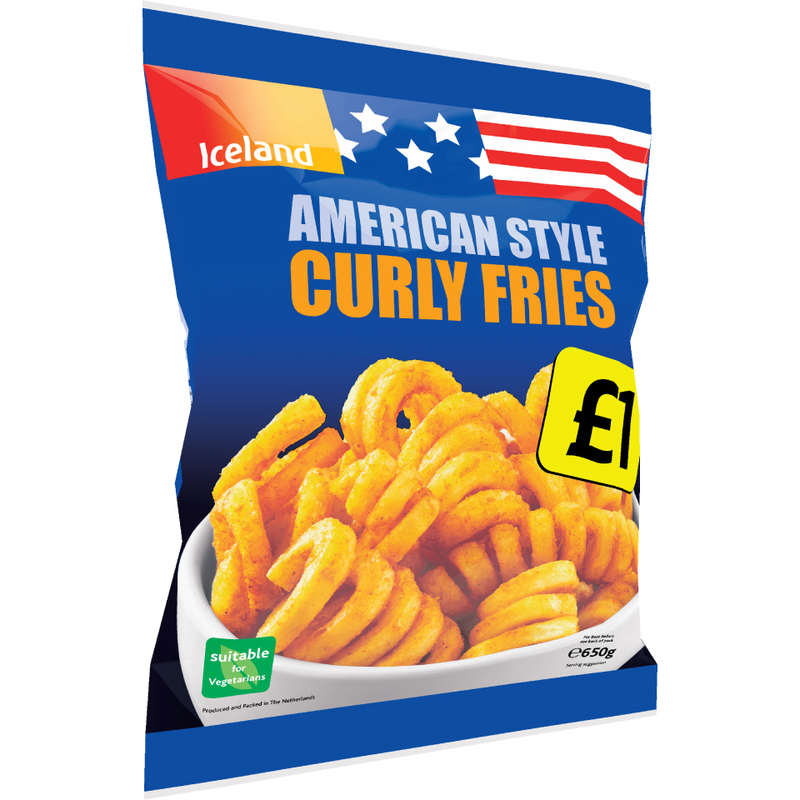 Across the Atlantic, 1.9kg are set to slide down Canadian and US consumers’ gullets this year. Australians and New Zealanders won’t even hit the 1kg mark. So, led by Russia, the top ten of mayo loving nations is dominated by Eastern European nations in the following order: Lithuania, Ukraine, Belarus, Belgium, Estonia, Latvia, Chile, Netherlands, Poland. In case anyone’s wondering, the world’s leading mayo brand is Hellmann’s (by Unilever), followed by Kraft. In the Ketchup stakes, Canada leads with 3.1kg per head, followed by Finland (3kg), Sweden (2.7kg), the UK (2.4kg), Norway (2.3kg), Austria and the US (both 2.2kg). Russians aren’t nearly as fond of ketchup as they are of mayonnaise, squirting just 1.4kg onto their bangers. And yes, of course Heinz is the world’s leading brand, who else?! Second in line, though, is Kagome, a Japanese brand, which I hadn’t expected. Must be big in the Asia Pacific region. As for mustard, Slovakia sports the most enthusiastic uptake with 1.6kg per capita in 2013. The Czech Republic is in second place (1.2kg), and France ranks third (1.0 kg). At least Germany features in the top ten. We do love our mustard, and we have tons of different regional varieties. 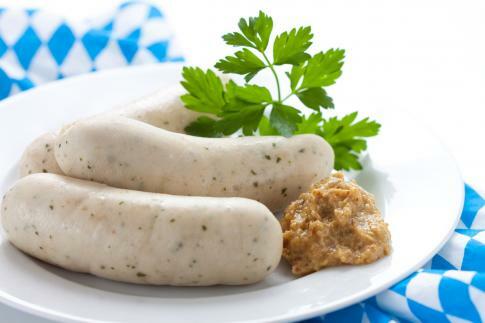 A very sweet type of mustard (as sweet as chutney), for example, is served with several traditional meat products and sausages, including the famous Weisswurst. Are you more of a mayo, a mustard or a ketchup person? Are there any weird food combos featuring any of these in your country or region? I’d so love to hear about that! 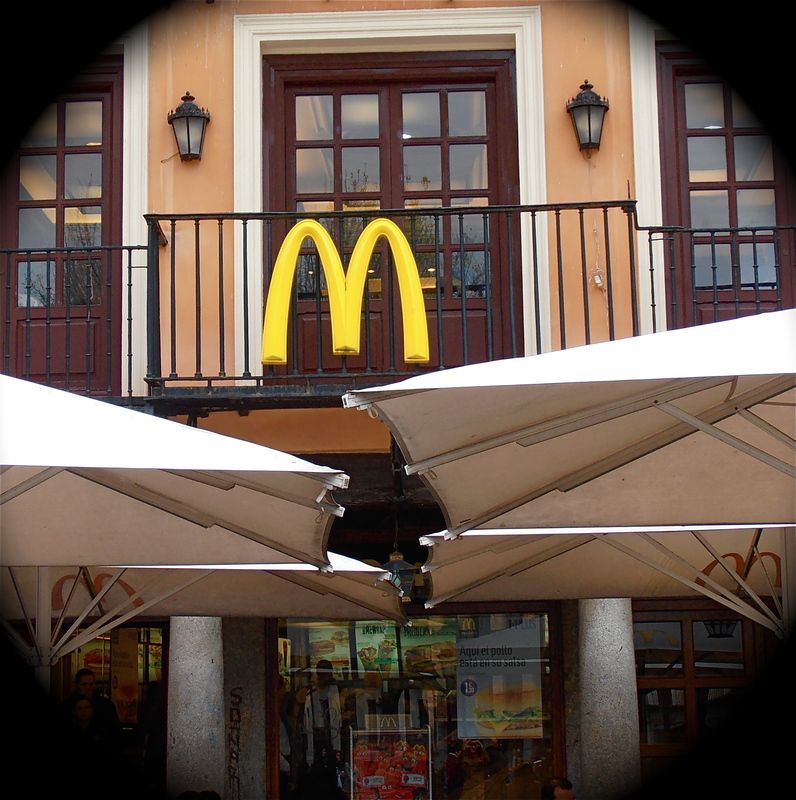 This entry was posted in Global Consumerism and tagged Eating Habits, Fast Food, Food culture, Food Industry on September 6, 2013 by ladyofthecakes. Who Eats The Most Pizza? Ever met anyone who didn’t like pizza? Neither have I. It’s probably the most wildly successful and non-controversial globalised food export that has ever come out of any one country, in this case Italy. Sure, one could argue that cola and burgers can be found just about anywhere on the planet, although these items are maligned in some regions as ‘a manifestation of American imperialism’. Nobody could ever accuse a slice of three-cheese pizza of corrupting young people’s morals or furthering anyone’s political objectives. Pizza is harmless, delicious, and endlessly customisable – just toss a couple of local ingredients on top and hey presto, that pizza is YOURS! As for tackling the question posed in the headline, I may not be able to come up with a totally satisfying answer. What I can tell you, though, is who are the most avid consumers of frozen and chilled supermarket pizza, and who spends the most in pizza joints. Frozen vs. chilled – no contest! 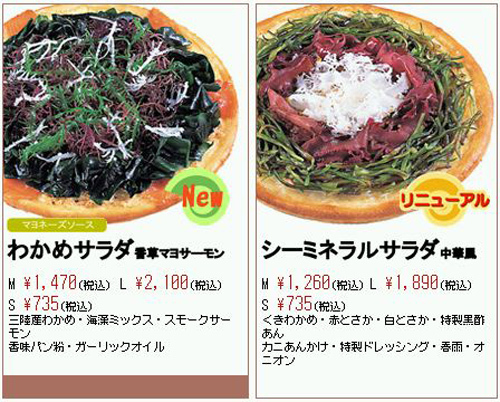 Frozen pizza is far more widely available (and far cheaper!) than chilled. In 2012, 1.4 million tonnes of frozen pizza where shifted by retailers, compared to just 332,000 tonnes of chilled. 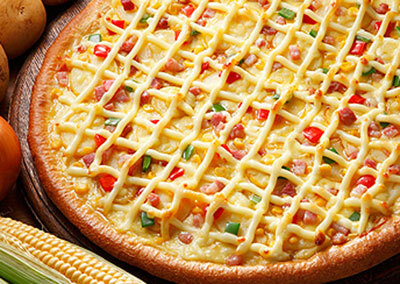 Spain, the UK and France were the top global markets for chilled pizza, while in Russia, Hungary, Argentina ad Turkey, for example, this type of product is not available in supermarkets. In the US, chilled pizza sales are dwarfed by frozen: 473,000 tonnes vs 25,000 tonnes in 2012. Although the US is the world’s leading frozen pizza market, its per capita consumption was a comparatively low 1.5kg per annum in 2012. Norway leads, with 4.4kg. Germany, Ireland, the UK and Austria are next in line. Italians mustered 0.9kg. Italy, despite appearing reluctant to fully embrace supermarket pizza, topped 2012 global per capita spending charts for takeaway/home delivery pizza, and Italians also splashed out the most in full-service pizza restaurants. Sweden and Finland splurged top dollar, per capita, on pizza fast food, US$62.8 and US$58.7, respectively, followed by Canada, Switzerland and Israel. Italy came 5th, and the USA 9th, with a miserly US$8.4. But you have to remember that food, and especially fast food, is considerably cheaper in the US than it is in Scandinavia, so this doesn’t tell us much about the actual quantities scoffed. China is fast developing a liking for takeaway pizza and for pizza restaurants, though you’d be hard pushed to find one in a supermarket. Why is this? Because Chinese kitchens are not habitually equipped with ovens. In such a densely populated country with sparse fuel resources, cooking has evolved to be quick and, above all, fuel efficient. Little ovens designed to be placed on a kitchen work surface that are suitable for heating up pizza are the preserve of comparatively well-off middle class consumers. Got any pizza-related gems to share from your country? I’d love to hear your thoughts and anecdotes. What is your most reviled pizza topping? I can’t stand pineapple on pizza. It just doesn’t belong there!!! This entry was posted in Global Consumerism and tagged Consumer behaviour, Cultural Differences, Eating Habits, Fast Food, Food culture, Food Industry on July 8, 2013 by ladyofthecakes. Global Consumerism: Who Eats The Most Fast Food? Fast Food. Everybody loves it. C’mon, admit it, even if greasy burgers aren’t your thing, you like at least one type of fast food. Sesame noodle stir fry? Take-away sushi? Falafel wrap? Raspberry-topped frozen yoghurt on the go? The fast food industry is HUGE. Just to give you an idea of the magnitude of the figures involved, global consumer expenditure on fast food in 2011 totalled US$583.2 billion. That’s not just people gorging themselves on burgers, fries and buckets of coke, mind, but it encompasses all manner of fast food, including Asian, Middle Eastern and bakery fast food, etc. The largest global market for fast food is – no surprise here – the US, followed by China, Japan, Brazil and the UK. In terms of annual per capita spend, Australia leads (ahead of the US!) with US$653 in 2011. US consumers forked out US$630 per person, closely followed by Canadians. In per capita terms, the US clocked up the highest spend on burger fast food, a whopping US$295 in 2011. Surprisingly, France also features in the top ten, with US$116 per head. 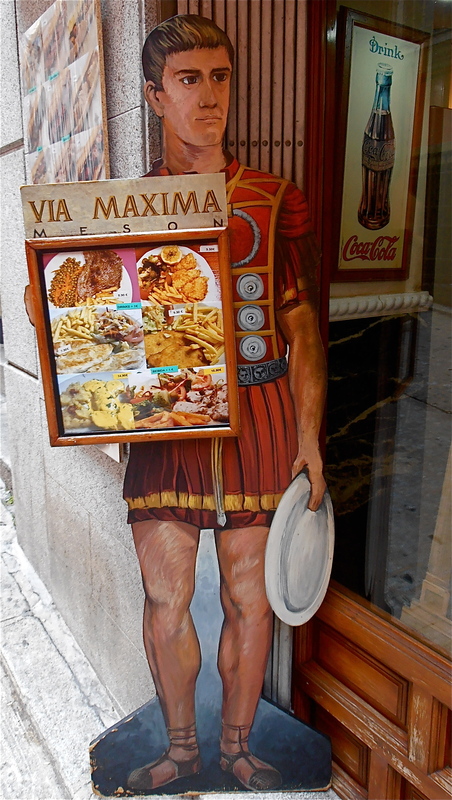 The Romans brought fast food to Toledo. Erm… OK… maybe not, but this Toledo restaurant seems keen to convince us! Burger fast food is the biggest fast food category, accounting for almost one third of total global fast food in terms of value. After burgers, Asian fast food is the second-largest category, and the fastest growing. Pizza fast food was worth nearly US$10 billion in 2011. Again, the US is the largest market, followed by Italy and Russia. In per capita terms, though, Swedes and Finns spent the most. Scandinavians are well known for being totally pizza crazy, they also top the per capita spend charts of frozen supermarket pizza. 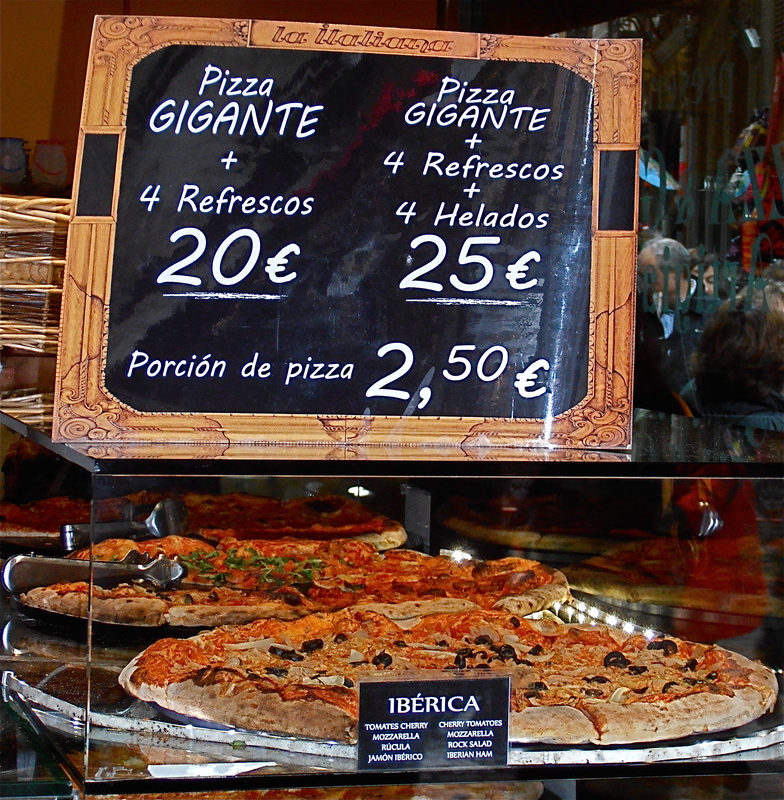 Why cough up €2.50 for an abstemious slice, when you can get twenty times as much grub for only ten times the price?! As you’d perhaps expect, the UK is the biggest marked for fish fast food. Yes, that’s down to the infamous ‘national dish’ that is fish’n’chips, on which the Brits fritter away US$2.3 billion annually – that’s one third of what the category is worth on a global level. This entry was posted in Food Follies, Global Consumerism and tagged Consumer behaviour, Eating Habits, Fast Food, Food culture, Food Industry on March 30, 2013 by ladyofthecakes. Which Countries Have the Worst Eating Habits? Have you ever wondered which nations guzzle the most coke, who polishes off the most chocolate bars, and who gorges themselves on ready meals? Well, you’re about to find out. As some of you may know, I earn my living by writing analysis articles about the food industry for a market research company. To do this job, I consult a vast database to identify trends and pull off the relevant statistical information to back up my fabrications. So, who do you think indulges in the biggest vatfuls of factory-churned slosh, a.k.a ready meals? Evidently, cooking is not a favourite pastime on the British Isles. Per capita consumption of ready meals in the UK stood at 14.9kg in 2012. Having spent two decades there, I can attest to the British love of ready meals, but these much maligned offerings do have their merits, as far as I’m concerned. If you want a curry of better average quality than the oil slick covered gristle that is served up in probably two thirds of Indian restaurants in the UK, and you can’t be arsed to cook one from scratch, go get it from the chiller cabinet in whichever supermarket is nearest. Avoid the really cheap stuff, obviously. You get what you pay for. Interestingly, France, which is so up itself about the superiority of its food culture, consumed 9.6kg in ready meals per head in 2012, surpassing the US’s 8.4kg. Finland took the closest swipe at the British Gold Medal, and other Scandinavian countries weren’t far behind. This is because Northern Europeans scoff by far the most frozen pizza (which is included in ready meals data). I guess this must have something to do with eating out being so horrendously expensive in Scandinavia. The US is Fast Food King, …but France ain’t all that far behind! It will not come as a surprise to anyone that the US emerges as the world’s largest market for fast food. In per capita annual expenditure, however, Australia came out tops with US$653 spent in fast food joints in 2011, compared to the US’s US$630. When it comes specifically to burger fast food, though, the US leads. France (not that I’m picking on them or anything), clocked up the 8th biggest per capita spend on burger fast food in 2011, globally. The French spent one third more than the British, who came in 15th place. Who downs the most Cola? You might think it’s the US, but it’s not. In fact, it’s Mexico, with an impressive 108.6 litres per head in 2011. It seems that those, who haven’t yet scrambled across the border in the dead of night, are living the American Dream in this way. And if you compare the two countries’ obesity and diabetes statistics, it’s working a treat! India is bottom of the coke charts with just one piddly litre. But they’ll catch up. As soon as they can afford to actually eat. First things first. And last but not least…CHOCOLATE! It’s the UK again, I’m afraid. With 11kg of chocs scoffed per head in 2012. The US only managed 4.4kg, and Spain, where I live now, a frightfully abstemious 2.1kg. Frankly, I don’t quite understand this – me moving here should have doubled this paltry figure. Must do better this year! If you’re looking for more detailled information on countries’ fast food consumption, click here. This entry was posted in Food Follies, Global Consumerism and tagged Beverages, Consumer behaviour, Cultural Differences, Eating Habits, Fast Food, Food culture, Food Industry on January 6, 2013 by ladyofthecakes.